What happens after I submit my application(s)? When your application is received, the Human Resources Department screens them for minimum qualifications. If the qualifications are met, applications are sent to their respective division offices. The divisions will decide which applicants to interview and schedule interviews accordingly. Human Resources will then call all applicants the division decides to offer employment. If you are not called with an offer of employment, you will receive a regret email. Can I apply for multiple positions? Yes. Once you complete one application, the system saves your education, work experience and special skills. If you decide to apply for another position, simply fill out the personal information at the bottom of the page. On the following screen, where it says “If you have completed an application for employment with Options for Learning before click here”, click on the blue hyperlink and the website will instruct you to enter your email and password. Your saved information will automatically populate. Do your teaching positions require a permit? 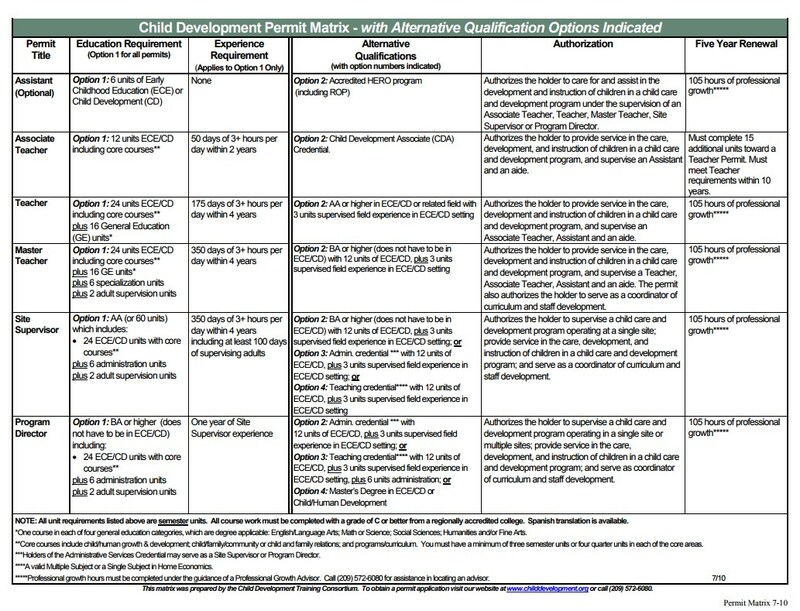 Our State and Federally funded programs do require teachers to have a Child Development Permit, as issued by the California Commission on Teacher Credentialing. Each job posting will indicate if this is a requirement. Where do I apply for a Child Development Permit? We encourage interested applicants to visit the State of California's website for permit applications, renewals, status updates and further information. Students enrolled in college classes may also seek assistance from their Child Development Departments. I am still confused about the permit process? Is there someone I can speak to? Please contact Karissa Chavarin at ﻿kchavarin@optionsforlearning.org with questions or clarification. May I get help paying for the permit fees? The Child Development Training Consortium, as funding is available, may be able to assist. Learn more by visiting their website HERE.